It is outstanding that creatures can go over a rough terrain at speeds which are remarkably higher than practically possible with wheeled vehicles. Indeed, even an individual, by getting down on each of the four legs if necessary, can travel or climb over terrain which is inaccessible for a wheeled or followed vehicle. It is therefore of immense enthusiasm to realize what machines for land locomotion can do if they are intended to imitate nature. Legged robots can be utilized for space missions on extraterrestrial planets and in risky places, for example, within an atomic reactor, giving autonomous legged robots a great potential. Low power consumption and weight are further advantages of walking robots, so it is important to use the minimum number of actuators. 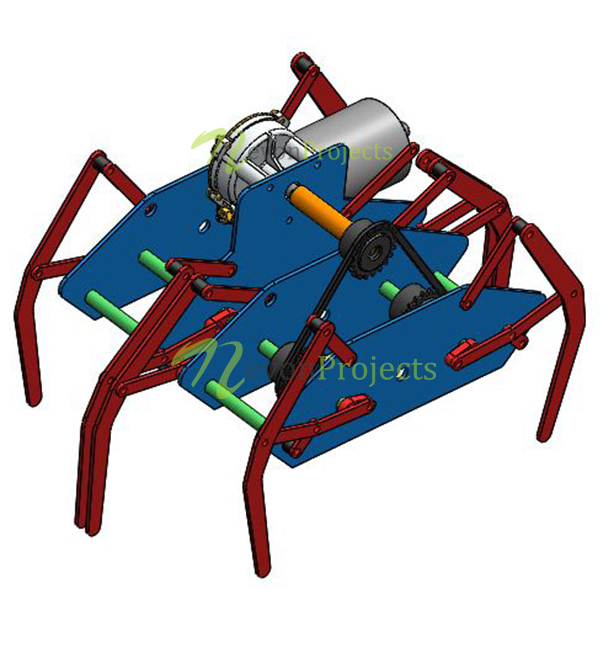 In this context, the goal for this project is to fabricate a six legged robot which will stroll using Klann mechanism. The kinematics of this robot will allow it to move on different terrain at different speeds. It has six links per leg 180 degrees of crank rotation per stride. The linkage consists of the frame, crank, two pivoted rockers, and two couplers all connected by pivot joints. The kinematics of robots structure enables it to convert the rotating motion of the crank into the movement of foot similar to that of creature strolling. The most important benefit of this mechanism is that, it does not require microprocessor, controller and other actuator mechanisms. By copying to the physical structure of legged animals, it may be possible to improve the performance of the mobile robots.